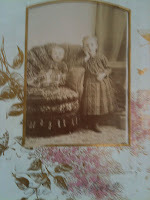 A few days ago I finished my morning blog post for Olive Tree Genealogy blog and sat back, feeling at loose ends. Okay I admit, even though I hate the word, I was bored. "What next" I thought. Work didn't appeal to me. My almost daily trips to Ancestry.com had pretty much exhausted those databases for my personal genealogy research for the time being. Yes, I still had mom's English ancestry to explore but I wasn't in the mood for census records. Ever felt that way? It's kind of like wanting an ice cream cone so you turn your nose up at a donut. With a bit of a ho-hum attitude, I began googling some of my English ancestor names. I've done that before and there's not usually anything terribly exciting. But this time I found an archived Geocities website that contained "Draft Wills and Indentures, Kent". One of the many pages was called "Draft Abstract of title of Mr. john Sandwell Stead & Others to 1,2,3 & 4 William's Cottages near Ramsgate"
John Sandwell Stead of Ramsgate Kent England was my great-great-great grandfather! The 3-page draft abstract contained details on John's wife's family. Her name was Emma Sutton and I knew very little about her except that her parents were William and Ann, she was born in 1812 in Ramsgate and according to her death certificate, a sister Charlotte was with her when she died. By the time I finished reading the papers and analyzing the information contained, I knew much more - that she had brothers William Sutton (a blacksmith) born ca 1816 married to Fanny; Robert Sutton born ca 1819 married to Charlotte Elizabeth and Samuel Cowley Sutton born ca 1820 married twice, the second time to Elizabeth Petts. Emma also had two sisters - Phoebe married to a Mr. Little and Mary Ann married to a Mr. Crunden or Crumden. Exact dates and locations of marriages of Emma's siblings was given. So were locations. This draft document was quite a find! Naturally I rushed back to Ancestry.com to start searching the census and other English genealogy records. Four hours later I took a break. In my few hours of research I found quite a bit on Emma's siblings in the 1851 and 1861 census records. I didn't get to 1871 or later yet but I will. I was able to verify that Emma didn't have a sister Charlotte (the one mentioned as being with her at the time of her death in 1875) but she did have a sister-in-law Charlotte. That is likely who was with Emma and that's an interesting cautionary note - to be careful assuming modern-day meanings for relationships. I knew from my 17th century Dutch research that often the term "Brother" could mean brother-in-law and "Sister" could mean sister-in-law, but I hadn't thought to apply that to my English ancestry. Other interesting (and possibly important) finds were that two of Emma's brothers were blacksmiths. Often such occupations in England were passed from father to son and that meant there was a very good chance that Emma's father William was also a blacksmith. No guarantees of course but a viable working theory. I also found many church records for Emma's sister Phoebe who left Kent and settled in Yorkhire. Thanks to her move, I was able to find her marriage entry in a parish church (the actual image) and learn that father William Sutton was a blacksmith. Aha! That helped confirm that a couple named William and Ann Sutton I'd previously found living in 1851 in Ramsgate were almost certainly my 4th great-grandparents. William was recorded as a blacksmith (and a pauper) but I had no proof that my Emma's father was a blacksmith. This find added more weight to my assigning this couple as my 4th great-grandparents. I actually learned many details that day - such as realizing that the name of one of John Stead and Emma Sutton's daughters (Phoebe Little Stead) almost certainly was in honour of Emma's sister Phoebe (Sutton) Little. Little things perhaps but all helping to build a more complete family history. Today if I have time I am going to hunt for William Sutton and his wife Ann. I'm also going to find out about the four cottages that my ancestor John Sandwell Stead had title to. Also on my list is to find out about Barking Essex and Tilmanstone Kent. All these details add to my family history and I'm excited to get started. Great news. The good folks at Fotolia have agreed to let one of the lucky readers of Olive Tree Genealogy Blog (http://olivetreegenealogy.blogspot.com) have a 2 week subscription to their website! For those who don't know what Fotolia is, please see my earlier review of this site with its millions of royalty free photos. 1. Share this blog post on Twitter OR Facebook by using the icons at the bottom of this post. One winner will be chosen from entries received at the email given above. One entry per person. If you tweet this post more than once you will be disqualified. If you send your entry to any other email other than otg.giveaway@gmail.com it will not be accepted. 2. Winner will be chosen from entries received. 3. One winner from readers of Olive Tree Genealogy Blog will be chosen to receive a prize. 4. The contest ends at 3PM PT Saturday July 2nd, 2011. 6. The winner will be notified via your provided contact information the week following the end of the contest. I've been playing with a cool app called Worldictionary. It translates words from other languages instantly with one quick motion of your iPhone. I can think of many uses for the genealogist. If you are in the Library or Salt Lake City or anywhere doing research and you find a set of church record books in another language, choose the language it is in from the list of language choices, point your phone at the word and a translation appears. Worldictionary recognizes and translates between 21 languages, ranging from Traditional Chinese, Simplified Chinese, English, Japanese, Korean, French, Germany, Italian, Spanish, Portuguese, Dutch, Swedish, Finnish, Danish, Norwegian, Polish, Hungarian, Russian, Czech, Slovak, and Romanian. I tried Worldictionary on some French text and then on Dutch text. It did a good job of translating the words. You can also translate two words side by side but it won't translate long phrases. However you can take a photo right in the Worldictionary App and then point it to each word in turn for a translation. One caveat: be sure you hold your iPhone steady! Even with its built-in anti-shake function, you need a steady hand. Genealogists could also find this useful for translating original text in records. Worldictionary won't work on handwritten text but I tried printing out the written text of a Dutch church record and then using Worldictionary to translate my printed words. It worked! I wish I'd had it when I was in Salt Lake City trying to translate some German church record words. You can also tap the translated word or words listed on the right hand side of the app to go through to a more thorough translation detailing example usage, structure, synonyms, and definitions from the web. You can also translate from English to other languages using Worldictionary. I'm not sure how helpful that would be to a genealogist but it's a cool feature! Imagine travelling to Germany, France or Spain or anywhere you don't read the language and you could instantly translate words in your hotel or restaurant or at the train station! The more I played around with Worldictionary the more I liked it. It won't translate any text in Italics so if you encounter something in a book that is in Italics you'll have to print it out by hand and then point and translate with the app. Worldictionary remembers your previous word searches and allows you to build your own database for increased translation efficiency. I did encounter one small problem that I'm sure won't affect very many people. I was using the App so it was open and at the Translation screen. 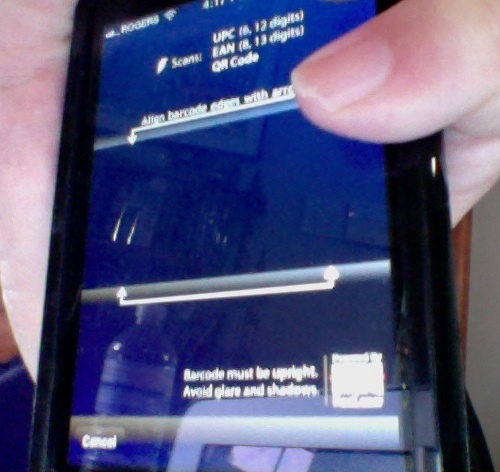 My doorbell rang so I set my iPhone down on my couch (face down with the app still open). I forgot all about it for a couple of hours. When I picked my iPhone up it was red hot and the battery almost completely drained. Oops. The poor app had been working and working, frantically attempting to translate my couch pattern into an English word. So take heed and don't leave the app open or face down on a surface or you'll drain your battery completely. You must have an Internet connection for the app to work and it will cost you $4.99 in the App Store but I think it's well worth it. If you're a genealogist on the go or even working at home, you may just find this app makes it to your favorite app list. William Massey, my husband's 3rd great grandfather, left Quebec and settled in St. Mary's Ontario in 1859. In October 1860 William began buying land in the small community. His wife and six children needed a home, and William built a frame house on one of the lots. Massey House ca 1920s Notice the cow! William eventually sold all but the lot where the Massey house stood. Some of the lots went to family members and to individuals who were related by marriage. Before William left Ontario to fight in the American Civil War in 1864, he transferred ownership of the lot and the house to his wife Ellen (for $1.00). He died in November 1865 shortly after returning home to St. Mary's, and his widow remained in the house. Eventually the land and house was transferred to their son Thomas Massey, my husband's 2nd great-grandfather. Thomas and his family lived in the home until Thomas' death in 1912. His widow Harriet continued to live in the house until her death in 1945. The next family member to own the house was their son John Massey, my husband's great-grandfather. 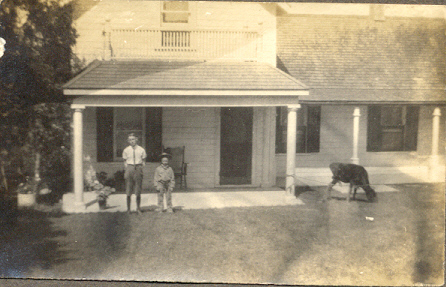 John's brothers lived in the house with him at various times. When John died in 1976 the home finally left Massey ownership. So this home had a 126 year history of Massey individuals living in it. 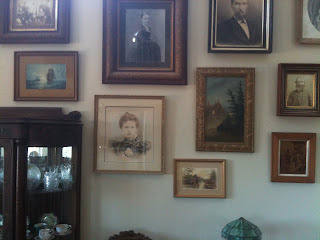 Recently my husband visited relatives in St. Mary's and while there, made a side trip to the Massey house. He wanted to take more photos to go with the photos you see here. At my suggestion he took copies of his early photos of the house in hopes of interesting the new owners with the house history. When he explained who he was and his reason for being there, the current owner of the house was fascinated and took him inside for a tour! She showed him around both inside and out and together they hunted for original foundations and parts of out buildings. To my husband's delight they found the original outhouse which is now a garden shed, and some foundations which would have been an outdoor shed (now a toolshed). Hubs also noted interior parts of the original house and was there for over an hour. Of course he left copies of the house photos he brought with him and promised to send the owner copies of the Abstract Indexes to Deeds and ownership papers that pertain to the property and the house. She was so interested that she phoned her place of work and told them she'd be late returning from her lunch break! Hubs was so excited about being allowed inside that he forgot to ask permission to take a photo of the exterior of the house as it stands today. Hmm... or was it deliberate so he could visit again soon? Whatever the cause, hubs had a huge serendipity moment and was able to go back to his 91 year old grandmother's home to share the story with her. She was in the Massey house as a young bride, sitting in the kitchen talking to her husband's grandmother Harriet, the widow of Thomas Massey. It was wonderful for hubs to share details of the house as it stands today. When he mentioned certain details it triggered memories for her which she then shared with him. All in all a wonderful genealogical day. Could This Be Marie Olsen? 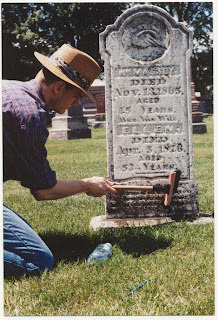 A gravestone with the name Marie Olsen and dates of birth and death (1879-1932) was recently found in St. Paul Minnesota. I read this story on Geneanet and CBSMinnesota and decided to have a quick hunt for Marie. 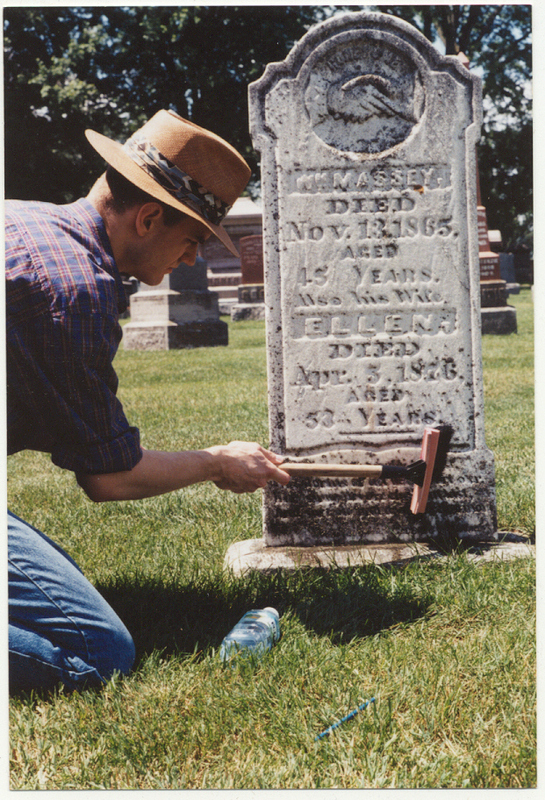 It's proving difficult to narrow down all the Marie Olsen results in Ancestry.com databases but I hope someone somewhere will know who Marie Olsen is and where her tombstone belongs. This is an amazing story. I love a happy ending and how wonderful for the descendants! KITTERY, Maine — A professional genealogist from Utah has helped find the rightful heirs to a 1800s gold ring found buried in the sands of a local beach in what he is calling an "almost unheard of" turn of events. The descendants live as far away as Virginia and North Carolina, but in a striking coincidence, they happen to be in New Hampshire this week for a family member's funeral. Danny Hall, "The Gentleman Genealogist" from Salt Lake City, Utah, heard the "unique" story of the engraved ring, as told in recent stories in the Portsmouth Herald. "I've never seen anything close to this before," said Hall, who specializes in solving family mysteries and reuniting relatives. "This is almost unheard of." Organizing Those Documents and Photos! Well, I'm at it again. I'm reorganizing my genealogy documents and photographs. It doesn't seem to matter what method I choose, I always end up changing my mind after using a method for a few months. I deliberate. I analyze. I mull over my organizational options: Binders? File folders? Emphasis on digital rather than paper? Granted things change. I find more documents, or more photographs come my way. I learn more about a specific family member. So my stack of documents and photos becomes even larger. Often I change my method of organization of my family files based simply on quantity. The more documents, the more room I need. And for that I like file folders in cabinets. But lately I've been thinking a lot about who will want all this "stuff" in the future. 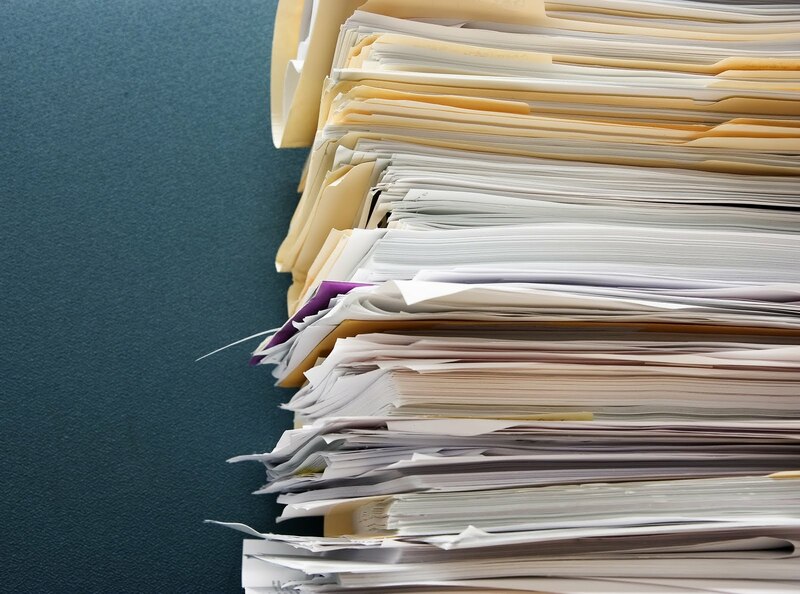 Even the most interested of my children or grandchildren are not likely to want both of my 3x2' filing cabinets with their 6 large drawers stuffed full of papers. Or my extra filing cabinets overflowing with the leftovers. What to do? I don't want digital as my main method of storage and viewing. It's a great backup but doesn't work for me as my number one organizational method. Binders haven't worked for me as I research all siblings of my direct ancestors on every generation. That's way too many binders and way too much reading for others. With all those constraints in mind I sat down to really think this over. What was my main goal? To ensure that my research into my ancestry is passed on. Okay what were my secondary goals? To create a method of storing my research that had some chance of actually being looked at and read by others. Any other goals? To create a way of keeping my documents that I could easily pick up and see fairly easily what I have and what I am missing. I realized that to meet these goals I had to keep in mind that it is my direct ancestor lines that will be of the most interest (perhaps the ONLY interest!) to my children or grandchidren. They aren't genealogists. They don't care about siblings. They don't care about doing any research personally. So if I want one of them to become the keeper of the work I've done, I have to pare it down. Paring it down does not mean I have to discard what I've worked on for the past 30 plus years. But it does mean I have to separate direct ancestors from siblings. It means I need two storage methods and that's when it hit me. I need to keep the "extras", that is the sibling and spousal research that are not direct ancestors in my family tree, in filing cabinets as I've been doing. And I need to start my binder system again. I need to move my direct ancestors documents, research and photographs and get those into binders. But I need to be strict with myself and ONLY place material about my direct ancestors in those binders. 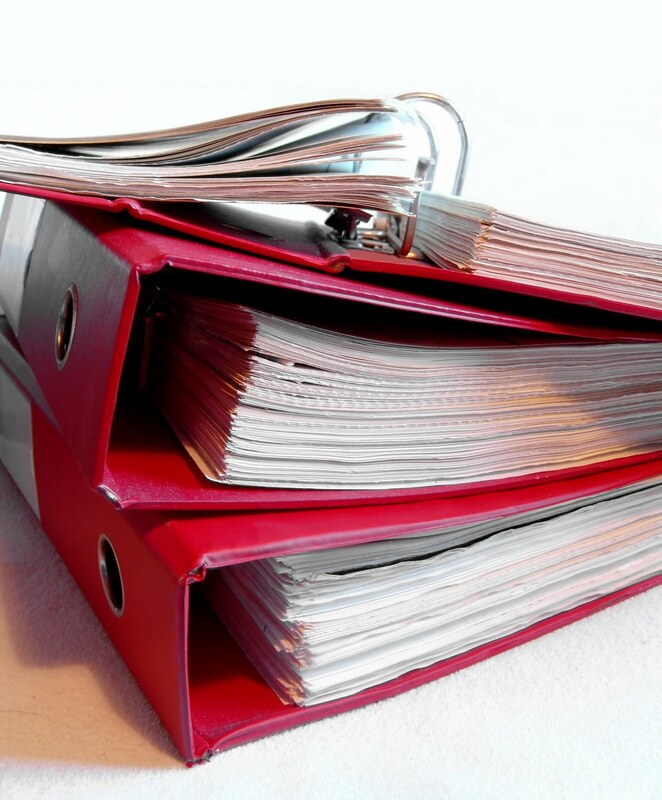 Binders allows anyone to pick one up, glance through it and keep all relevant documents in one place. Keeping in mind that I'm creating these binders for non-genealogists, I need to keep it simple. No confusing genealogy reports, just a simple chart showing the direct lineage from me back through the years. Add a family group sheet for each direct ancestor and that's it. Then I add the images for census, church records, vital stats, land records and so on. Whatever I have found for each ancestor goes into the binder for that family surname. That includes my scanned and printed photographs for the family. I realize I could achieve a much nicer (visually) product by creating a family book for each surname but that's just too time-consuming for my immediate needs. Once I have all my documents and photos in a binder, I can begin work on that. But to do this quickly and efficiently, I've decided on binders. It's almost a complete circle because at one point several years ago I switched from binders to filing cabinets due to the sheer volume of material I'd collected. In the past I've always organized based on what suited ME and my needs, but not with the future in mind. Now I've reached an age and a stage where that's my utmost concern - passing those genealogy records on. So for the past week I've been sorting and placing documents into binders. One of the perks is that I'm actually finding copies of certificates that I'd forgotten I have! I do have a tendency to get side-tracked and to start incorporating extraneous non-direct ancestor items such as my grandmother's brother's original military records. I have to constantly remind myself that I'm not creating the binders just for me, but for future generations. I'm thinking I might start a second binder for each family surname and make those strictly for documents and photos that pertain to non-direct individuals (siblings on all generations). That allows me to preserve the documents in an orderly way and if one of my children or grandchildren decide they want everything, it is there for them in labelled binders. If they decide they only want the information on our direct ancestors they'll be able to do so easily. I've been playing in Fotolia.com for about a week now. And I'm loving it! Fotolia has approximately 13 million royalty free images, illustrations and videos available for download. You can use the downloaded images in all print, electronic, online materials and webpages and there are no royalty fees to pay. Most images can be bought for about $1.20 to $4.00 per image, or less if you buy in bulk. Pricing varies as it depends on how many credits you buy. The more credits you purchase, the less cost to you per image. Fotolia states that you can purchase photos for as little as 14 cents and I assume this is when you purchase credits in bulk. One credit costs $1.20 (U.S.) and the minimum purchase is 10 credits ($12.00). The Fotolia FAQ page explains all of this quite well. I used their basic search box to search for keywords, such as genealogy and history. What impressed me was the professional quality of the images that came up in the results pages. The specific keyword genealogy brought up just over 200 "hits" but by changing the keyword slightly (family tree, ancestry and others) I was able to generate many choices. There is also an advanced search feature which I really like. Here you choose from a broad topic, then you are given a drop down list of sub-categories within that topic. This drilling down goes on for some time and anywhere along the way you can stop and enter a keyword if you wish, then search. As an example I used the representative category "People" Then I chose the sub-category of "on location" At the next drop-down list I chose "house" then in the keyword box I typed "grandmother and child" That gave me very specific images that I downloaded for an article I am working on. I also tried a conceptual category such as Emotions &Feelings, then Happiness and then Pleasure and then used the same keywords. That gave me different images which also fit what I'm trying to portray in my article. I could also have searched by clicking on a tag (keyword) and browsing. There are so many ways Fotolia could be beneficial to bloggers and genealogists in particular. Find and download stock images for blog posts - readers love photos and sometimes it's difficult to take one yourself. For those who are writers and work on family history books or genealogy books in general, Fotolia provides a way to acquire professional royalty-free images to illustrate your work. Downloading an image is quick and easy. You can either put it in your Lightbox to save it for later. Lightbox has unlimited storage. You can add it to your shopping cart until you have several chosen. Or you can check out one image at a time. You choose your licence, either credit or subscription and whatever licence fits your needs, then you accept the terms and download to your computer. It's much faster to do than for me to explain it. I found something I think is really cool and that's the ability to see what images you have already purchased! I found after a few days I forgot what I had already downloaded. But clicking on "My Files" brought up a list of all my images. It also showed me which ones had expired and which ones were still available if I needed to download them again. You have a 72 hour period in which you can download purchased images. Fotolia also offers free images and if you like them on Facebook it's fast and easy to find those images. You also get a few extra by becoming a fan of their Facebook page. There is more to be discovered at Fotolia but this is what I've found so far. I'm impressed and I plan to keep on looking around and downloading! I also have some exciting news about an opportunity for one lucky reader of my Olive Tree Genealogy Blog to win a two week subscription to Fotolia.... so be sure to watch for the blog post about this in a few days. Disclaimer: Fotolia approached me and asked if I would review their site. They have not paid me to write this review but they did provide me with a one month subscription so that I could explore the site and its options thoroughly. Located at 12 Water Street in Penetanguishene is the building commonly referred to as "The George Gordon House". A plain, white stuccoed, one and a half storied, cedar log house, it is said to be the first home built in the town. George Gordon was a fur trader and in the west prior to the War of 1812. He was a witness to the seige of Michilimackinac and was in Sault Ste. Marie when it was burnt by the Americans. 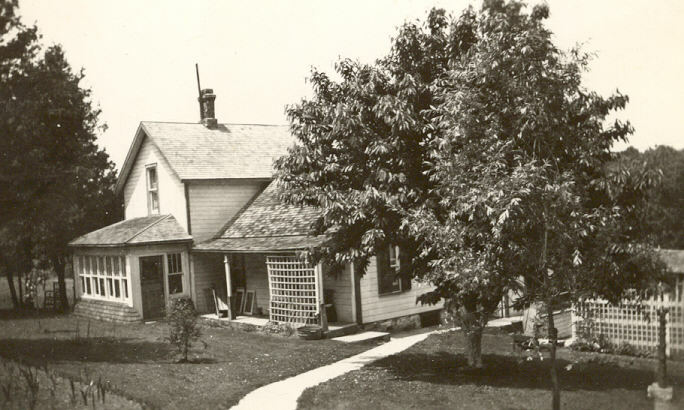 The house Gordon built shortly after he arrived in Penetanguishene in 1825 still stands and is lived in today. The age of the house may make it one of the oldest in Simcoe County, perhaps even Ontario. The fact that it is still lived in certainly makes it unique. It is local lore that the first Roman Catholic mass was said in this house, shortly after the arrival of the Drummond Islanders in 1828/29. But we have a problem. The owner is an elderly lady who has had to vacate the house and is presently in hospital. Where ownership goes from here is difficult to determine, but if the house is to be saved, not just for her descendants but all the townspeople and their descendants, action has to be taken now. Heritage Penetanguishene, a council appointed committee, has not designated it as a "property of interest" and they are reluctant to designate the house a historical property because it has had stucco applied to the exterior. We would like to work with them to have this historically valuable house declared not just a place of interest but eventually an official historical property. Here it sits, part of our history and totally unprotected from bulldozers or neglect. We need your help! A few years ago when we hosted the Simcoe Branch of the Ontario Genealogical Society, I was approached about the preservation of this house by a number of people who were Gordon descendants . If there is enough interest shown by the public, we may be able to persuade Heritage Penetanguishene to move quickly on the designation. If you are interested in seeing this landmark preserved, please join the Committee to Save the Gordon House by contacting Pam Tessier at: savethegordonhouse@gmail.com. Numbers matter and we do have a voice! Readers may recall that on May 10 this year I mailed in my mtDNA Test Kit which I ordered from Family Tree DNA . Well, last week an email arrived saying my test results were posted! I was pretty excited and immediately went to the Family Tree DNA website to read the results. I have to confess that I'm confused. 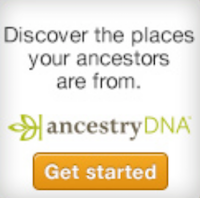 I'm not sure what I've learned that will help me in discovering my maternal origins. It seems my Haplogroup is J and I have 5 mutations from Cambridge Reference Sequence (CRS). But what does it all mean? I've got a lot of reading to do! One thing I spotted during a quick browse of various articles was reference to Haplogroup J being found more frequently in centenarians than in younger individuals. (Source: http://www.fasebj.org/content/13/12/1532.full) The women on my mom's side all live to be in their 90s so that's kind of interesting. An intriguing but still puzzling result is my Recent Ancestral Origins section. Here FamilyTreeDNA displays a chart showing the countries of origin reported by the people I match. This intrigued me because my maternal lineage as far back as I know it (Mary Ansell born Kent 1771), is based solidly in England. But my chart results show I match 80 people from England, 54 from Germany, 22 from Ireland, 13 from France, 11 from Sweden and several other countries where my matches are under 10. I'm going to have to do some reading to understand what these numbers mean because there are also percentages given showing what % of the total population tested within each country of origin match my test results. England is low - yes it says I match 80 people who gave England as the country of origin of their most distant female ancestor. But it then shows that I only match 1.2% of the population tested. That seems low to me, especially since I also match at 1.2% the total who gave Austria, 1.2 % who said Denmark and 1% who gave Switzerland as their most distant country of origin. More research on my part is definitely required for me to understand these numbers. I also gave in to temptation and upgraded from mtHVR1 to Mega. The sale price at Family Tree DNA was too good for me to resist! An extra step you can take with your DNA test results is to submit them to mitosearch then you check for matches in their database. I did that and sent off emails to the people who most closely matched my 5 mutations. We'll see what develops from that! It also seems to me that I need to join some DNA projects so I'm off to hunt for any that I think apply. FN1: I've added my name and blog URL to the header of this post because two other blogs are copying my DNA articles without permission and posting them on their blogs. No link back to my blog is given and my name is omitted as the author. Since I hope to make connections with other genealogists through my blog, I have added my name and blog URL. This may help ensure that some notation is kept that indicates to readers of these unscrupulous blogs that the articles are not written by the blog owners in question. These same blog owners have disabled their comment feature and removed email addresses so I cannot contact them. Last week I spent the afternoon at the Guelph Civic Museum. Kathleen Wall, the Assistant Curator, had previously found many of my ancestors' names listed in the Museum's indexes - my parents, grandparents and other assorted cousins, uncles, aunts, grand uncles and so on. So I made a trip to Guelph with my husband to take a look at what Kathleen found. Kathleen was waiting at a long table when we arrived. There was a large box opened at her side and she was looking through a book. 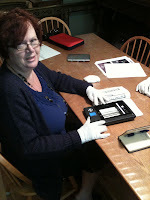 Two extra pairs of white gloves lay on the table for hubby and I to wear and Kathleen turned another book over to me. The two books Kathleen had ready were the Acta Nostra Yearbooks for Guelph Collegiate Vocational Institute which both my parents attended. Several aunts and uncles as well as my grandmother's and grandfather's brothers also went there. So the odds were that I'd find something in them that related to an ancestor - and perhaps even a photograph! I was armed with my trusty Flip-Pal Mobile Scanner which readers of this blog know I love. It's invaluable - light weight and easy to use, the perfect tool for scanning images of documents or yearbook pages or just about anything I might find in the Museum. I sat down and slowly went through the 1933 yearbook while Kathleen looked through 1929. My first find was mention of my mother winning an award for typing in the 1933 GCVI yearbook! 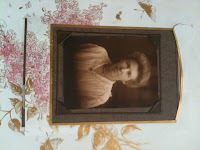 Kathleen found several photos and mentions of my grandmother's brother Len Peer in 1929 and other years. A lot of the museum holdings are indexed which makes searching a bit easier. So in the case of some of the yearbooks, Kathleen knew that my mother's name was somewhere in that 1933 book. We just didn't know what page so it did require careful scrutiny to find. I found out quite a bit that afternoon. I learned from a 1929 GCVI Yearbook that my father had graduated from High School and was working at Holman Luggage. I never knew that. A 1927 Yearbook gave a little light-hearted description of my dad which I really enjoyed reading. My father died when I was 14 so my memories of him are limited and the yearbooks enabled me to get a better sense of him as a teenager. One of the most exciting items that we found was a photograph of my grandfather McGinnis! Kathleen found a "J. McGinnis" listed on her computerized index so we took a look. 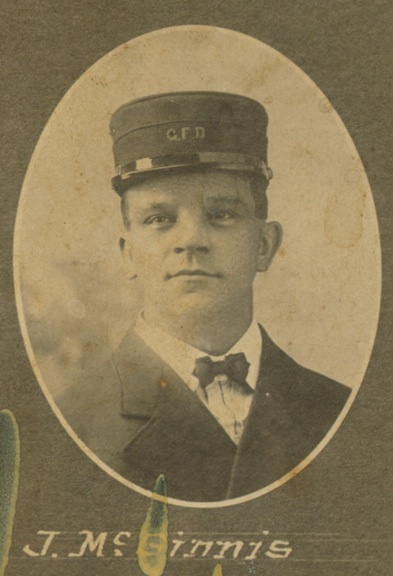 And there he was - my grandfather Joseph McGinnis in an official photograph of the Guelph Fire Department in 1909. I was stunned. No one had ever mentioned that my grandfather was a firefighter. And as he died long before I was born, I never knew him. In fact only one photo of him taken circa 1916 existed in the family, so seeing him 7 years earlier was a thrill. Kathleen was a font of knowledge about Guelph - its buildings, its history, and she informed us that 1909 was the first year that the Fire Department became an official paid organization. Prior to that time it was a volunteer department. Imagine! My grandfather was one of the first paid Firefighters in Guelph! I'm thrilled to know this. We looked at many items during the next 3 hours. The Museum is moving to a new location so I could not see all the physical objects they hold which have some relation to my family, but I was able to view many on their computer. Kathleen kindly printed out several interesting documents and photos for me and I'll go back in September when they are settled in their new location. 1. Email or phone the museum to ask about their services and fees. 2. Provide a brief list of the names (with dates) of ancestors who you are searching. 3. If the museum has information or documents, ask if you can reserve a time to visit and view the holdings that relate to your ancestors. Perhaps you will be as lucky as me and find a Kathleen who is willing to assist you. 4. Show up on time if you have a pre-arranged appointment. 5. Take your genealogy notes (preferably on a laptop, iPhone or iPad), paper, pencil, pen and your Flip-Pal Mobile Scanner if the Museum allows it. Ask first! I was able to scan many items of interest at the Museum. Kathleen has continued to send me photos and information via email and I am one overjoyed genealogist! I started my genealogy research and found John H. McKim in the 1881 census for Londonderry Nova Scotia. He was 14 years and living with his parents William and Margaret McKim. My next research find was the 1902 marriage record of John Herbert McKim age 36 born Colchester Nova Scotia to parents William McKim and Margaret Thompson. John was marrying Sarch C. Willis, 36 born N. Walsingham Norfolk County Ontario to parents Robert Willis Sr. and Mary A. Staley. The groom John H. McKim gave his residence as Kootenay British Columbia and his occupation as Miner. I was able to find John McKim and his parents again in the 1871 census for Lower Londonderry, Colchester Nova Scotia but I was more interested in finding out if he and Sarah Willis had any children. And what was the family relationship of the woman in the photo labelled "Ethel Willis"
After a few hours I narrowed the possibilities for "my" Ethel Willis to Molly Ethel Willis born January 1884 to Robert Willis Jr and wife Lucy Atkinson. Little Molly Ethel was recorded as Ethel in the 1901 census for Tilsonburg with her parents Robert and Lucy Willis and grandparents Robert Willis and Margaret Thompson. If I have the correct Ethel Willis she was Sarah C. McKim nee Willis' niece. There are many census records for the McKim and Willis families. The last items I found were the newspaper obituaries or death notices for both John H. McKim and his wife. John Herbert McKim and his wife Sarah C. Willis are buried in Fairview Dutton Cemegtery in Dunwich Township Elgin County Ontario. Their son Edwin McKim is listed as Edmond Willis McKim in the Roll of Honour for Dutton and Dunwich of "Boys Who Paid the Supreme Sacrifice" in WW2. If anyone knows more about this family and who the other people named in the photos are, I'd like to hear from you. 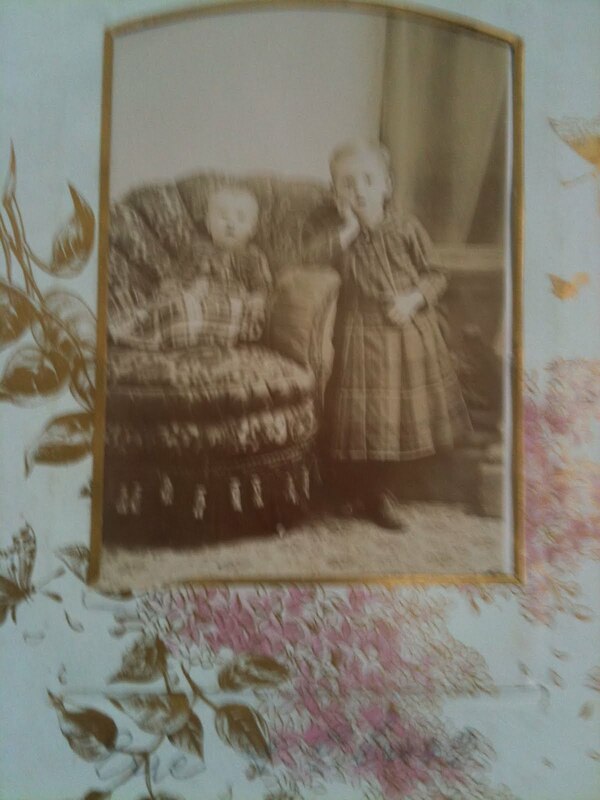 We still have these two identified photographs both taken in Tilsonburg Ontario. More Lost and Found Ancestor photos can be viewed at Lost Faces website. Dr. Barbara B. Reitt will describe what she learned in a four-year search for truths long hidden by the family and what compelled her to respond to her late father’s memoirs by researching and writing a biography of his grandmother. Lost Faces: The John H. McKim Photo Album Rescued! Recently I spotted a forlorn little photo album in an antique store in Ontario. The album had seen better days and was in shambles. 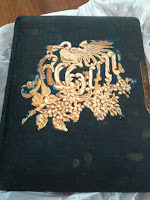 A faded turquoise cover was torn from the interior pages which had slots for 30 cabinet cards. Many of my readers know that I rescue Civil War Era CDVs (Cartes de Visite) and tintypes but rarely do I buy cabinet cards. There are just too many of them! But this album cried out for some loving attention. 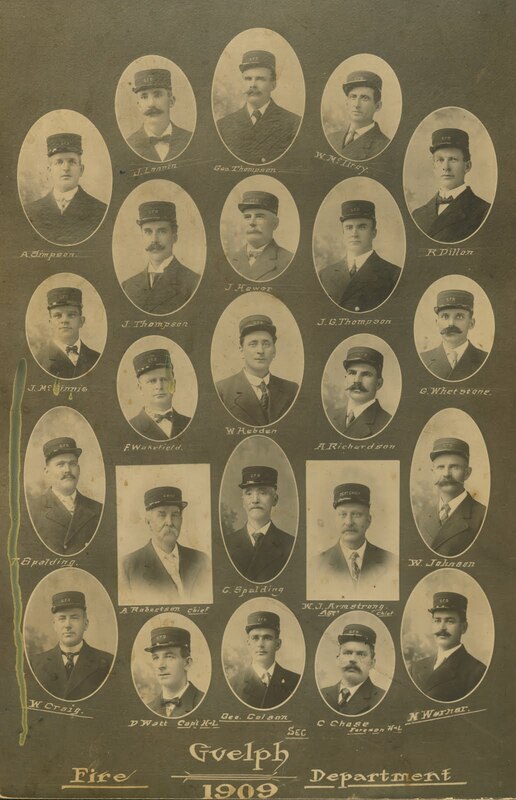 Many of the slots for cabinet cards were missing. There were a few names scribbled here and there. It's normally the type of album I'd walk by without giving it too much thought. But for some reason I felt compelled to purchase it. My first step when I save an old album is to photograph the album and its interior photos exactly as they are. This documents my find and the order of the photos. 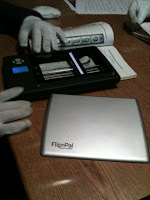 Then I remove the photos and carefully record all information on the photos themselves and on the album pages. Lastly I do some research to see if I can figure out who the family is and what the family groups are. This album was a challenge but inside the front cover was the inscription "John H. McKim, Londonderry Station, Colchester County Nova Scotia" I assumed (incorrectly as it turned out!) that the photos inside would be Nova Scotia photographers. But when I removed the surviving 13 cabinet cards, all but one were Ontario photographers. Not much to go on! After I removed the cabinet cards the only extra inscription found on the verso (back) of one of the photos was "Mrs. Jas McKim, Byron Ontario" with "Jas." crossed out. Under that, in the same handwriting as on the inside first page of the album was written "Mrs. J. H. McKim"
One photo was of a creek and on the verso was a note signed "J. H. McKim" The note gave an explanation of the creek but wasn't much help in figuring out the family groups. Please see my next blog post on Finding John H. McKim. National Archives UK sent an email about Naval officers' service record cards and files (c.1880-1950s) now online. More than 5,000 naval officers' record cards in series ADM 340 are now available on DocumentsOnline. 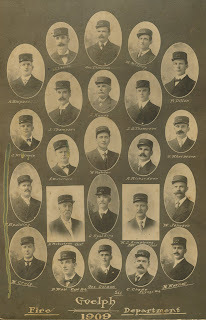 The introduction of cards and files in the early 20th century provided a single continuous record of an officer's service, whereas previous records in books and registers had often been more fragmentary. To find out more about the records of commissioned officers in the Royal Navy, go to the research signpost. A few years ago my husband took a Y-DNA test for his Massey surname. There were no matches as the database of others who submitted was very small. Hubs had previously connected with a woman who was also a Massey descendant. Annie knew her Massey ancestors back to the mid 1700s and my husband was convinced that his Massey line linked to hers. But hubs only knew his Massey line back to William Massey born ca 1818 in Wicklow Ireland. He could not narrow his search to a more specific location nor could he find William's parents. Hubs' suggested that his Massey connection have her father's Y-DNA tested. She agreed and her father took the test. Ancestry.com has a good DNA testing database and so does Family Tree DNA Hubs used Family Tree DNA this time. Annie's father who lives in England, ordered the Y-DNA test. The results arrived. Annie's father matched hubs on 25 markers - an exact match. The comparison chart showed that hubs and Jim (Annie's father) had a 94% chance of sharing a common ancestor within the last 12 generations. This led to many excited email exchanges between hubs and Annie. Circumstantial evidence and clues had led hubs to believe his Massey origins were near Delgany and Templecarrig area of northern Wicklow in Ireland. Annie knew that her grandfather and his ancestors were born in Delgany and environs. Hubs knew that the Delgany Parish records existed but could only be viewed at an archives in Ireland. He was already in contact with another woman who has ancestors in Delgany and she agreed to travel from her home in England to the archives to copy the parish records for him. Lo and behold there was a baptism of an unnamed son born in Delgany in 1818 to an Edward and Catherine Massey from Templecarrig. William Massey named his first born son Edward and his second born daughter Catherine so if he followed naming conventions this could be the right family (first born son after paternal grandfather, second born daughter after paternal grandmother) There were other clues in the Delgany Parish records and those combined with Annie's father's Y-DNA match further cemented the conclusions that hubs' Massey line originated near Delgany, Wicklow Ireland. 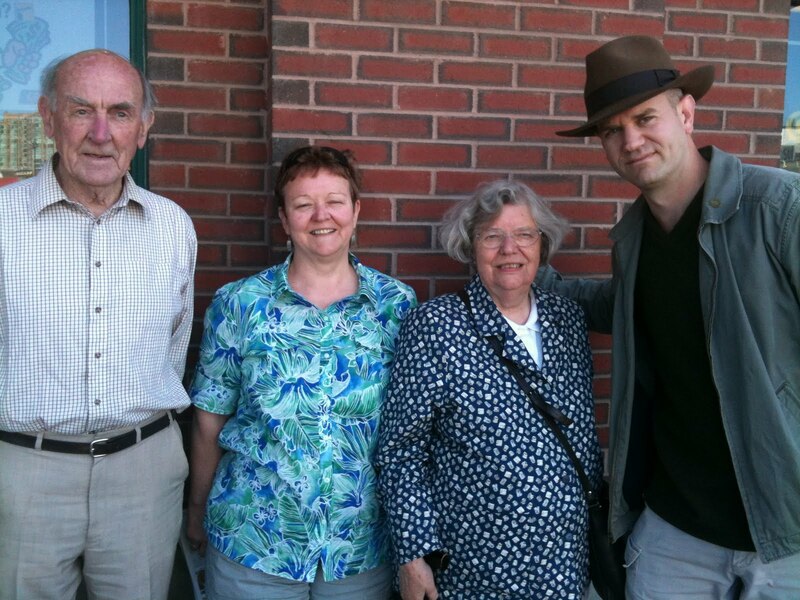 This month, we had the pleasure of meeting Annie and her parents! Her mom and dad were in Canada for a visit and arranged to meet in a city near us. We spent a delightful afternoon with hubs' new-found cousins and exchanged many genealogy stories. What a wonderful time we had. Hubs upgraded to the 67 Marker Y-DNA test recently so fingers crossed that more exciting adventures and finds arise from this test. Recently I started playing around in Archives.com and was pleasantly surprised at the changes and additions to the website. There are various death records in particular that I found of interest but I was impressed by the large collections of various vital records from different states. I can't list them all here as there are far too many but you might want to have a look for yourself. I was also happy to see that Archives.com also provides a Request Service - an on-site county search for any court, criminal, or civil record in the United States. That's so helpful to those of us who don't have easy access to records we need for our ancestral lines. It will soon be that time of year again - when my two eldest grandchildren come to stay for their annual week-long genealogy visit. 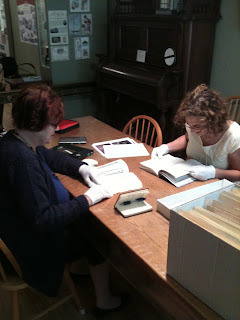 I call it a genealogy visit because every year I devise a genealogy activity as part of their time with us. Over the past 7 years I've managed to dream up various activities for them. We've done a Genealogy Cemetery Hunt) (looking for a specific ancestor's tombstone that I know is in the Cemetery). We've done Ancestor Cards for Children. In this one I created a deck of playing cards with ancestor's photos and brief biography on each one. We've done lots of other genealogy activities such as Making a Genealogy Time Capsule and creating a Genealogy Remembrance Garden, and a Genealogy Board Game. This is the first year I've had a bit of a genealogist's block. I have been struggling to come up with a fun genealogy idea! My grandchildren are ages 13 and 11. The oldest is a boy and the younger a girl. I've been contemplating creating a genealogy video with them. My grandson is in a theatre group and every year since he was 5, my husband has made fun videos with them. They write an outline, figure out the scenes and come up with costume ideas, then my husband films it and edits the movie to burn on to a CD ROM for them. So I was thinking that perhaps I could extend that to encompass a genealogy video this year. My idea (it's only in its infancy stages so isn't very detailed yet) is that they can choose any ancestor they want and use an actual experience or time period from that ancestor's life to create a 10 or 15 minute video. They know the ancestor stories because they've heard them over and over since birth! They could choose two ancestors (parent-child, husband-wife, siblings) and create a short story from an experience that is a true story and part of an ancestor's life. Perhaps they'd like to act out their 10th great grandparents sailing to the New World in the 1630s, or walking Niagara Falls on a tightrope, or the first female pilot in Canada, or our ancestors leaving Ireland during the Famine ... the possibilities are endless. They could choose the story and the ancestors, then take a day to come up with the different scenes and create the costumes. Then my husband could film them. The more I think about this idea the more I like it! However when I suggested it to hubs, he wasn't sure he liked how much work it involved for him - director, cameraman, props and editing! I'll keep you posted. We still have a month or so before my two oldest grandchildren come for their visit. Yesterday I received an email from Family Tree DNA stating that a Y-DNA67 match was found between my brother's DNA test and another person in the Family Tree DNA database. I was pretty excited and went to see who we matched and whether or not the surname was the same as ours (McGinnis). Readers might recall that I recently upgraded my brother's Y-DNA test to 67 markers. There were several matches ranging from genetic distances of 1 to 7. But the two that jumped off the page were two McGinnis males. One was a genetic distance of 2, the other was 3. You might be wondering what that means. Wow that means there is a 96% chance that within 12 generations we share a common ancestor. I'm even happy with that 8 generation showing of 83% because I can trace my McGinnis ancestry back 6 generations counting me. So there's a chance if my match knows his ancestry back further, we can link up or at least narrow locations for residency and origins. Those are pretty good numbers too. I'm waiting eagerly to hear from the other connection. Fingers crossed that he knows something we don't! Springpad has made yet another great addition to their iPhone and Android app. Now you can scan a barcode on any book and save the information in Springpad. Let's say you are in a bookstore and you spot several genealogy books you want. But you're a little short of cash so you just want to jot down the titles and authors for another day. Springpad then saves all of relevant information, including title, author, photo, price, reviews, and links to buy (such as Amazon.com) And if there is no photo don't worry. 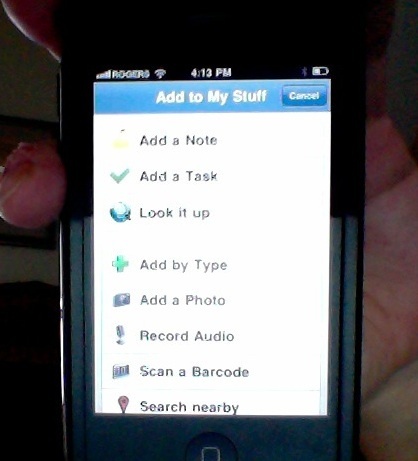 Springpad gives you an option to take a photo or add one from your camera roll. If you take one of the front cover of the book, it is instantly added to your Springpad information. Did I mention that this barcode information is now synched to all your devices that have Springpad? And the book you want goes on sale, they notify you of the new price. For example here's a book on herbs that I like. I scanned the barcode and the information popped up. I added a quick photo of the cover as one wasn't automatically added. I'm looking at it here in my Firefox browser on my MacBook Air. I'm happy with this little App and plan on using it much more. Dubbed as one of the society’s most popular programs, “Come Home to New England,” is a fun-filled week of family history discovery and education. This program features research, individual consultations, interesting lectures, group meals, and other exciting activities. Join Olive Tree Genealogy and Ancestors At Rest on a Cemetery Walk of Trinity United Church Cemetery in Beeton, Tecumseth Township, Simcoe County Ontario. I have uploaded the third and last video of this Cemetery to the Olive Tree Genealogy YouTube Channel to join my other Cemetery Walk videos. I'm using an iPhone App called EasyBib and I'm really liking it. This app allows you to scan a bar code on a book using your iPhone. The bar code is then converted to a bibliographic citation! You can choose from MLA, Chicago/Turabian or APA styles. After your citation is ready you simply email it to yourself. I'm using EasyBib to quickly and easily format citations for the history and genealogy books I review here on Olive Tree Genealogy blog. Not only does it save me typing everything out, it ensures that I've cited the book correctly and in a consistent format. I can also sort my list of citations alphabetically, by date, by tag (keywords which I add manually) or by source. I am also able to print my list of citations, or save to GoogleDocs or Save for later on the website. One caveat - many of the genealogy books that I've purchased for my personal reference library do not have bar codes. However I can manually enter the ISBN number and EasyBib searches for the book. If it is not found, I can enter the title, author and publisher plus date of publication on the EasyBib website and it is formatted for me correctly. EasyBib is free from the App Store. On 9 June 2011, The National Archives will be taking part in #AskArchivists Day alongside archives from around the world. On the day, you can use your Twitter account to ask us about our collection, online resources and how to research at The National Archives. We'll also be answering questions about archival practice and advice, conservation, digital preservation and web archiving. Please join NEHGS as we explore our Irish immigrant ancestors’ native land, the rolling hills of Ireland. We will discover spectacular scenery, and enjoy legendary Irish hospitality in internationally renowned hotels and restaurants and elegant private homes. Please e-mail education@nehgs.org if you wish to be placed on a waiting list for the event. I admit it. I have been brainwashing my grandchildren since birth. I tell genealogy stories constantly. I choose ancestors with stories that I hope will excite them or enthrall them or make them curious. I repeat the same stories as many times as my grandkids want to hear them. It's amazing what they remember, and what they love to hear. Every year on their annual summer visits to our farm they beg me for the same stories over and over. "Tell us the story again about our ancestor who walked Niagara Falls on a tightrope"
"Gramma tell us about our ancestor who fought in the War of 1812"
My living room is full of ancestor photos in antique frames (I just counted and there are 20 in our cathedral style living room. That doesn't include those on the staircase, in the loft and other rooms of the house). Every year we play "Name the Ancestor" with the grandchildren over the age of 10. This is a little game where they try to name our ancestors on the wall, including their relationship to each person. Winner is the child who gets the most names correct and can give the correct relationship (example: That's my Great great grandma Ruth). For those who think there shouldn't be winners versus losers, I'll let you in on a secret - children love competitions. They love to win. The grandchild who doesn't come first will almost certainly try harder next time or listen more attentively when I talk about each ancestor. Did you notice I said we only play this as a competition with the children over age 10? Children over the age of 10 understand winning and not winning. They don't cry when they don't win. With the younger children I make it like the game "I Spy." Only my version is called "I Spy With My Genealogy Eye". Notice that we don't spy with our "little" eye, we spy with our "genealogy" eye! My 6 year old grandson loves this game. He takes his turn with "I spy with my genealogy eye, an ancestor who is Gramma Ollie's Grandma" (I'm Gramma Ollie) Then the rest of us have to point to the correct person in the photos. Even my 3 year old grandson tries to play but he doesn't quite get it yet. His version goes like this "I spying with my all-a-gee eye, something like a lady in a dress" But that's okay because as soon as one of us in the game picks the right "lady in a dress" I make sure I name the person they chose. "Oh that's Grandma Ruth! Good going, you chose Grandma Ruth with your genealogy eye"
Yes it's called brainwashing. Being a parrot. Repeating what you want your grandchildren to remember. If their attention span can handle it, I add a bit along the lines of "Grandma Ruth was my grandmother. She's your great-grandmother" I've usually lost them by this time but some of it will sink in. I also prompt them with sentences like "Okay it's your turn. Use your genealogy eye to choose an ancestor for the rest of us to guess" I know. I'm shameless when it comes to my determination to turn at least ONE of my 13 grandkids into a genealogist! And so I brainwash my grandchildren with stories and games like "I Spy With My Genealogy Eye." Fingers crossed that one will pick up the torch and carry on. Join NEHGS as we explore the vast resources of the New York State Archives. The weekend includes individual consultations, lectures, and a group dinner.